Boss is a young, delinquent from Mazinger Z who served as the comic relief characters for the series. Boss began as a bully and Kabuto Kouji's rival at school, but quickly became an ally, often scouting for Mazinger Z on his motorcycle, or getting into some sort of slapstick mischief. The two members of Boss's gang were Nuke and Mucha. 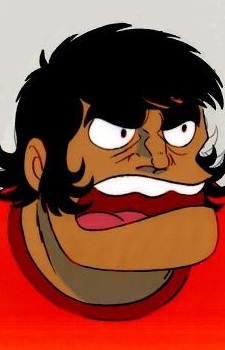 In Great Mazinger,Bakarasu and Kouji's younger brother Shiro also join the gang. He's also Sayaka Yumi's long-time school friend and has a huge crush on her. About two-thirds of the way through Mazinger Z, Boss and his gang found an abandoned warehouse full of junk, and kidnapped the scientists at the Photonic Research Institute to build Boss his own giant robot, Boss Borot, out of the junk in the warehouse. also his cousin misato who is a former model comes to work in the photon plant she does domestic work cleaning, cooking etc her behavior is the opposite of sayaka Boss also made occasional appearances in Grendizer, and was one of the main characters in the Mazinkaiser mini-series. In Shin Mazinger, Boss plays a smaller role than before. He is now the boss of all the delinquent gangs in Japan, and comes to Atami at the beginning of the series because it's the only area of Japan without a gang leader. After arriving, he identifies Kouji as the strongest student in the area and decides that by defeating him, he'll become Atami's leader, but before he can do this, the Ashura Corps launch their first attack on Atami and they are forced into hiding. After the attack, Boss, Nuke and Mucha are now forcibly employed at the Kurogane House, having run up an enormous tab by staying at the spa for too long. They also apparently do some work for the Photon Power Labs, as they are seen using a large construction robot around the area. This robot is later used as the basis for their fighting mecha Boss Borot. Boss also continues his friendly rivalry with Kouji, and occassionally helps him out throughout the series.